Fill your school breaks with creativity, color and fun! There's something for everyone in our school-year camps with both full-day and half-day options. Whether you’ve been to our camps before, or never heard of us until now, these camps will challenge you wherever your level of experience may be. All camps are designed for ages 5-14 (we’ll break into smaller groups based on age). Projects vary among age groups in order to be age-appropriate and may be customized according to the individual interest of students attending each week. ​Homemade gifts come straight from the heart! Your child will have the chance to create multiple projects with a variety of materials to be given as thoughtful gifts this holiday season. Projects include a 5x5” stretched canvas simple Master study in acrylics, drawn portrait, and a polymer clay sculpture. ​Two whole days of pottery-making fun! Working in low-fire ceramic clay, students will learn and experiment with a variety of pottery-making techniques including slab and coil forms, surface design, glazing, firing and 1:1 training on the potter’s wheel. Camp include a supervised noon- 1pm lunch hour (meals not provided). In this camp, students will experience all things cartoon and comic! Designed for students of all skill levels, this camp explores various cartooning and comic styles ranging from Disney to Manga. Students will work step-by-step with instructors to build and develop their skills with exciting new projects ranging from character development, storytelling, and building their own comic. Working primarily with graphite, colored pencil, watercolor and acrylics, students will learn a variety of drawing and painting exercises designed to help master brush control, build rendering skills, practice mixing colors and effectively construct a composition. Each student will create works of art that will build their skills and their confidence. Whether your child is a brand-new beginner or an aficionado of all things art, this camp provides an opportunity to build skills, learn new techniques, and unleash your child’s imagination. 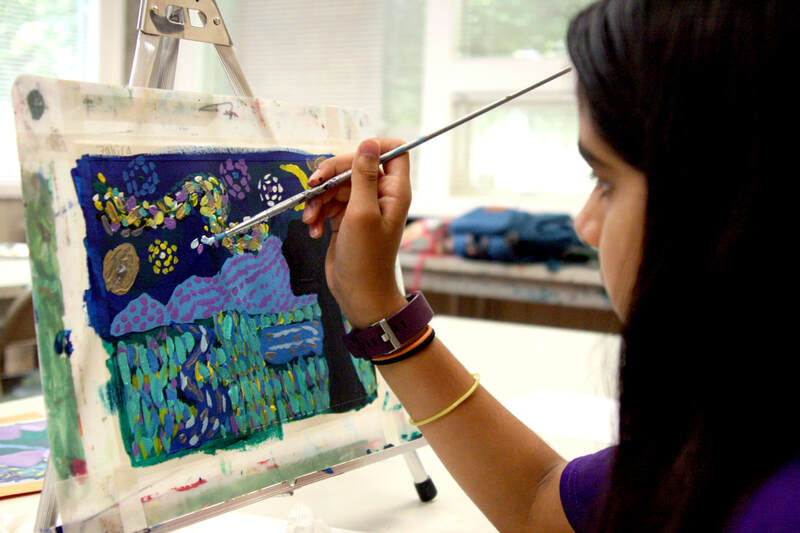 Working with a variety of visual art forms, campers will have chance to stretch their creativity in new ways. Each day brings new projects that include drawing, painting, printmaking, and sculpture. This full-day camp includes a supervised noon- 1pm lunch hour (meals not provided)​. Working in low-fire ceramic clay, students will learn and experiment with a variety of pottery-making techniques including slab and coil forms, surface design, glazing, firing and 1:1 training on the potter’s wheel. Each pottery camp provides new experiences for campers to improve their skills both on the wheel and with different hand-building projects. Camp includes a supervised noon- 1pm lunch hour (meals not provided).